Mount Wise Swimming Baths were constructed for Plymouth City Council by Mr F J Stanbury, of Devonport, in 1923. The site was formerly Bullock Dock. Mr Stanbury was later called upon to repair the floor of the Baths, which the Borough Surveyor found to be faulty. There appears to have been no formal opening ceremony but on Monday September 10th 1923 an "aquatic festival" took place involving pupils from twenty Plymouth schools. Saint James the Less School, in Plymouth, won the overall competition, with six first prizes, two seconds and one third. Three of their first prizes were won by Master C Gent. A cafe was erected at Mount Wise Swimming Baths in 1937 and it was later equipped as a dance hall, the "Waldorf" Dance Orchestra regularly appearing there. For six old pennies one could dance between 8 and 11pm, always ending, of course, with the Last Waltz and God Save the King. 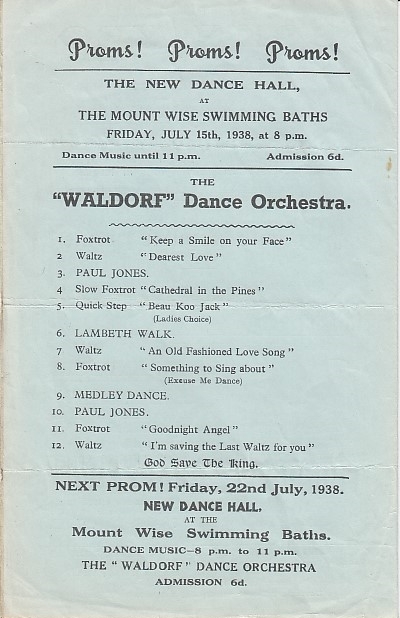 The music and dance programme from Friday July 15th 1938.